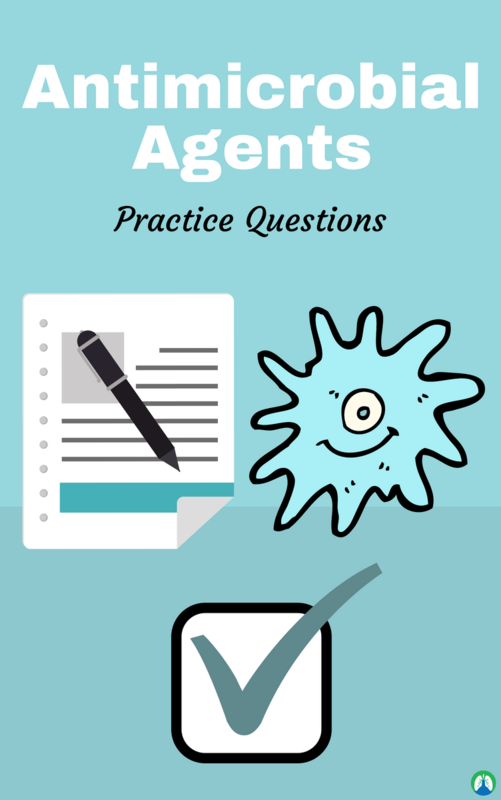 This study guide is loaded with practice questions all about Anti-microbial Agents. This is yet another class of medications that you will be required to know as a Respiratory Therapy student. To help, we’ve listed out some of the best practice questions out there on Antimicrobial Agents. I recommend going through these practice questions until the information sticks. Are you ready to get started? 1. What are anti-microbial agents? They are chemicals that eliminate living microorganisms that are toxic (pathogenic) to the patient. 2. What is the ELISA (Enzyme-linked immunosorbent assay) Test? It shows what bacteria is resistant to antibiotics. 3. What is the most common reaction to Penicillin? 4. What is the meaning of MRSA? 5. What does Pharmacodynamics mean? It is how the drug affects the body. 6. What is an agent that kills bacteria or inhibits bacterial growth and/or replication? 7. What is the preferred agent that kills bacteria at serum levels that are safe for the patient? 8. What is an agent that inhibits the growth and replication of bacteria at serum levels that are safe for the patient? 9. What can happen if a bacteriostatic agent and the immune system does not kill the bacteria, the doses are skipped, too low or stopped completely, before the immune system has killed all the bacteria? Resistant bacteria emerge or enough variable organisms may remain to start a 2nd cycle of infection. 10. What is an agent that is effective against a wide variety of microbial species? 11. What is an agent that is effective against only a single or very limited number of microbial species? 12. Where does the choice of microbial agent depend on? It depends on the agent that is most selectively active against M.O and has the least potential to cause toxic effects. 13. What should be noted when choosing a microbial agent in an emergency? Start with a broad-spectrum agent, and when culture and sensitivity results are available, then switch to narrow-spectrum agent. 14. What is the major reason why bacteria acquires drug resistance? Overuse and misuse of antibacterial agents are the major reason. 15. What drug class is among the most narrow-spectrum agents and can cause hypersensitivity, neurotoxicity, and hemolysis? 16. What bactericidal drug class inhibits the synthesis of the bacterial cell wall, contains the B-lactam ring, and is used for the treatment of gram-positive bacterial infections? 17. What are the goals of anti-microbial therapy? They are administered to an infected person and the drug can destroy the infectious agent without harming the host’s cells. 18. What is the proper use of antibiotics? Take exactly as prescribed (do not skip doses or discontinue before completing therapy). Follow instructions regarding foods/beverages, as acidity can affect efficacy. It causes more infectious diseases than any other parasite, and bacterial infections cause substantially more morbidity and mortality. Anti-bacterial drugs are among the most important pharmacological agents we possess. Anti-bacterial agents belong to the chemotherapeutic drugs classification (selective toxicity to invading parasites). Anti-bacterial agents and antibiotics destroy or inhibit the growth and multiplication of microorganisms. 20. What is associated with gram-positive cocci bacteria? Staphylococcus, streptococcus, streptococcus pneumoniae, and enterococcus. 21. What is associated with gram-positive bacilli? Clostridia, corynebacterium, listeria, lactobacillus, and actinomyces. 22. What is associated with staphylococcus associated infections? Skin, soft tissue, bone or joint infections, endocarditis, and food poisoning. 23. What is associated with streptococcus associated infections? Skin infection, pharyngitis, endocarditis, and toxic shock syndrome. 24. What is associated with streptococcus pneumoniae infections? Pneumonia, otitis, sinusitis, and meningitis. 25. What is associated with enterococcus infections? UTI, GI tract infection, and catheter-related infection. 26. What is associated with clostridia infections? Tetanus, antibiotic-associated diarrhea, gangrene, and botulism. 27. What is associated with corynebacterium infections? 28. What are the properties of antibiotics concerning the antimicrobial spectrum? Those antibiotics that have activity against many different bacteria are called broad-spectrum agents, usually prescribed first. Selective activity against a few organisms is called narrow-spectrum agents after an organism is identified. ID is performed via culture in the agar plate. 29. What are the properties of antibiotics concerning drug-resistant bacteria? Organisms frequently make biochemical or genetic changes to adapt to their environment, bacteria can multiply in as little as 20 minutes after several hours, some bacteria could have genetic mutations making them more resistant to the drug. Repeated courses kill off susceptible organisms but leave more resistant strains unaffected. The main cause of antimicrobial resistance is overuse or inappropriate use of antibiotics and can be viewed as a bacterial survival mechanism. 30. What are the specific bacterial infections and their treatment for MRSA? Staphylococcus aureus often found on the skin of many people but does not cause a problem among healthy individuals. The biggest threat is to the older-adult population and hospital-bound; and it is increasingly common among the athletic populations. Unresponsive to first-line antibiotics for staph infections. 31. What are the therapeutic concerns of using antibiotics? The most common are allergic reactions and GI problems (nausea, vomiting, diarrhea, abdominal discomfort). These can be minimized by taking the medication with food but it varies by drug. Others include ototoxicity and nephrotoxicity with prolonged use. Sulfonamides, tetracyclines, and fluoroquinolones all increase patient’s sensitivity to UV light. All antibiotics can cause c. difficile enteritis. Those taking metronidazole, vancomycin, linezolid or quinupristin/dalfopristin means that the patient has a resistant type of infection.